Make sure your pet's needs are met before grooming. If an animal is hungry, tired or uncomfortable, they may behave poorly in a stressful situation like grooming. Be sure they are as comfortable as possible before any grooming, and avoid any grooming if your pet may be sick or injured. Be sure they have had a drink or light meal (unless the groomer requests otherwise), and take a bathroom break just before grooming begins. Meet with the groomer to learn their techniques. Different groomers use different tools and techniques. Visit with your groomer and discuss what their methods may be, including how they react to behavior problems. Be candid about your pet's personality and potential issues that may arise, and choose a groomer who will keep your pet's best interests, safety and comfort in mind. Socialize your pet to unusual situations and noises. Many pets react badly at the groomer's because they are not used to the setting, strange people or the loud noises of hoses, clippers and fans. If you socialize your pet more frequently, however, they will be accustomed to diversity and may not be as bothered or react as poorly. Visit pet parks or play areas, take your pet to more crowded locations and otherwise get them used to unusual situations so they can adjust better. Train your pet and familiarize your groomer with appropriate commands. Training helps your pet stay focused and gives them a sense of comfort and stability. Use commands like stop, wait or stay and teach your groomer the tone of voice, hand signals or other cues you use when training your pet. If they are able to use the same commands, your pet is more likely to respond well. Have small treats on hand to reward your pet for good behavior. Observe a grooming session to spot any bad behavior triggers. You know your pet best, and if you can watch a grooming session, you may notice things that are upsetting your pet and causing bad behavior. Reputable groomers should always have a way you can observe a session, and you can take notes about problems that occur and talk to a trainer or your veterinarian for possible solutions. Learn to do more grooming at home. You may be able to do many grooming tasks – trimming long fur, clipping nails, rinsing eyes, etc. – at home and spare your pet unnecessary trips to the groomer. 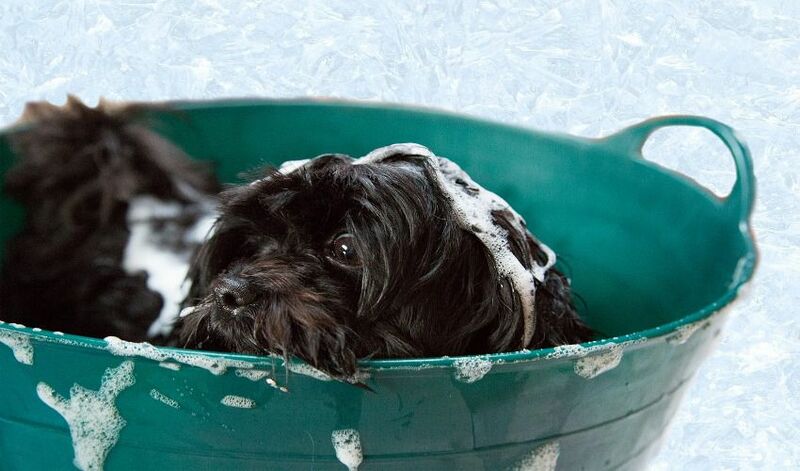 As you groom your pet, you will also be familiarizing them with grooming in a more comfortable environment, which can help lessen their poor behavior.